$80 for 4 days. Only $2/day after. Stay in touch for just a few dollars per day with an InReach rental from OER. 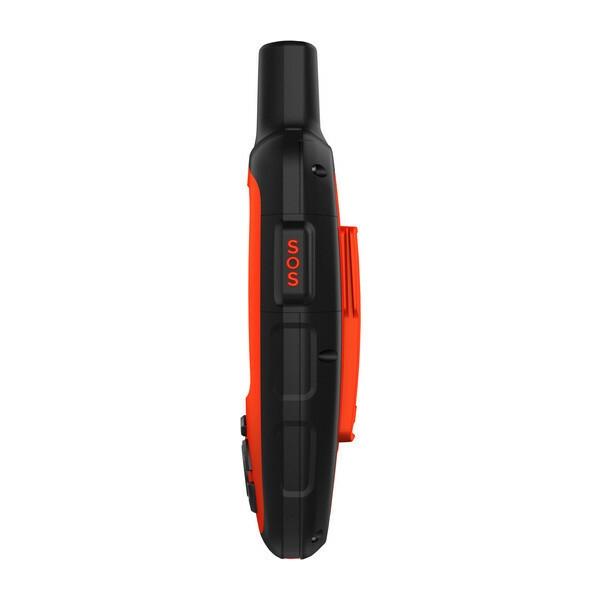 Handheld Satellite Communicator and GPS Navigation in one device! We provide a basic data plan in every rental. For more messaging or tracking usage, you will save by pre-selecting an upgraded plan (vs. paying overage fees) See the “Data” tab for details on each plan option. Won’t have access to a computer to sync your device, or don’t want to worry about getting it setup correctly? Choose this and we’ll send you a simple form (contacts, preset messages, time zone, mapshare settings, etc.) and then setup and sync your InReach so it is 100% ready to go out of the box. Add external power banks. Each power bank stores enough to fully recharge your InReach 1 time. Power Banks ($5.00) This must be a number! 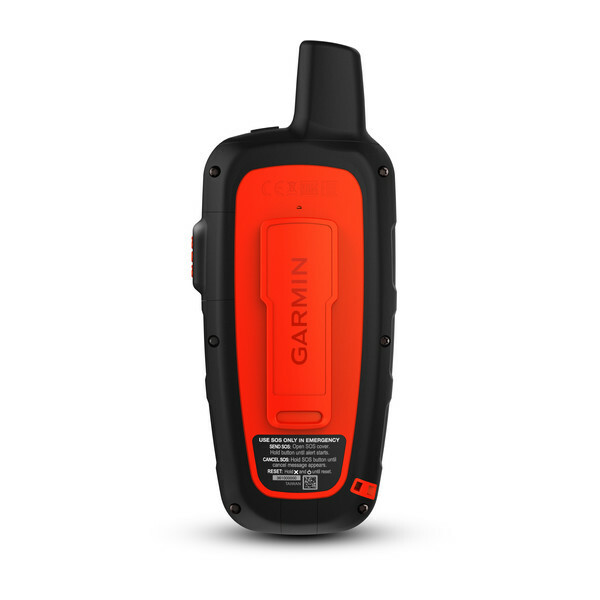 Garmin InReach Rental – Explorer+ with sat messaging, GPS Navigation, tracking, routing, waypoints, breadcrumbs, & more. 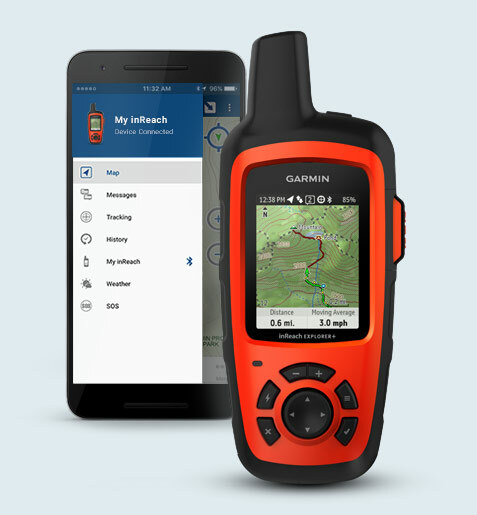 OER’s Garmin Inreach Rental – the Explorer+ or Mini models – offer backcountry communication, tracking, SOS, social media sharing and more. The Explorer+ model adds preloaded TOPO maps and integrated GPS navigation. It is a handheld GPS Navigation unit and Satellite communicator combined in one unit! Pair it with your mobile device (Apple iOS, Android, or Kindle Fire via Bluetooth) and free Earthmate app to access downloadable maps, color aerial imagery and more. The Garmin inReach Explorer+ is easily charged using the included USB cable, and can be used with most solar chargers. SOS messages are received by GEOS, a worldwide emergency response coordination center with 24/7/365 staffing. 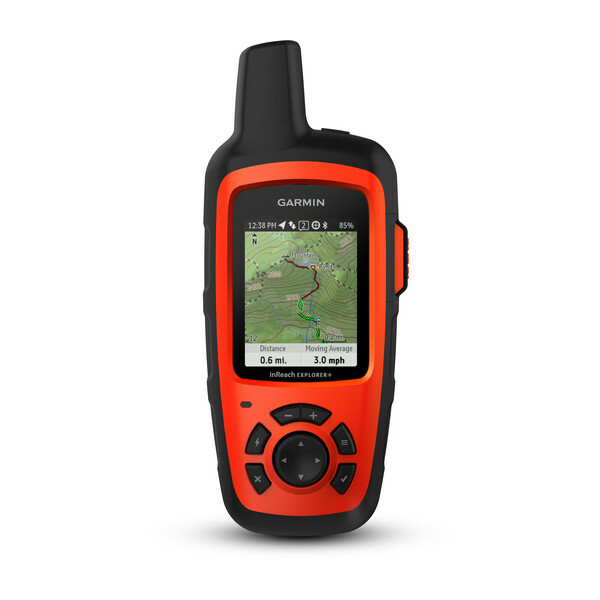 More information on Garmin InReach Rental data plans available in the ‘Data’ tab. •	Pre-Set messages: Create 3 pre-written messages with pre-determined recipients. •	Messages: create a custom message on the fly and send to a contact or email/sms number. •	Tracking: send out tracking pings for folks back home to follow on your MapShare. Tracking intervals available from 2 minutes to 4 hours. •	Text Messages (incoming and outgoing): 10 messages included & $0.50/message overage. •	Text Messages (incoming and outgoing): 30 messages included & $0.50/message overage. Level 2 – more included messaging and ability to use unlimited tracking and location pinging. Great for when you plan to message more and possibly track your travels. 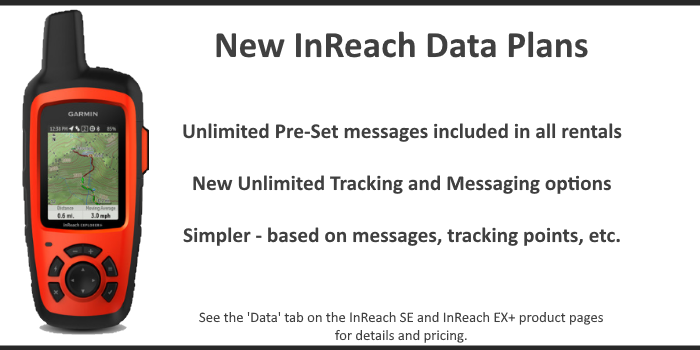 Level 3 – unlimited messaging and tracking. For high use. Level 4 – detailed tracking with unlimited 2min intervals. Great for race tracking, etc. – Setup your 3 preset messages. – On the EX+ – setup routes, waypoints, import .gpx/.kml files, etc. After you have completed the setup you will need to plug the device into a computer when you get it and Sync it to move that info to the device. If you won’t have a computer to sync with (i.e. we are shipping to a hotel, etc), won’t have the time, or are worried about getting setup done correctly, we can do it for you for a small fee. If you choose this option we’ll send you a form requesting information regarding contacts, messages, settings preferred, etc. and we will enter all of that info into your account and sync the device before shipping it to you. It will be ready to go right out of the box!